“Intel Today” has a great break-down of the operation blaming the Russians for the Skripal and Rowley/Sturgess poisoning, along with comments by former Ambassador Craig Murray. Nothing adds up in this attempt to create Cold War 2.0 by linking these two incidents. 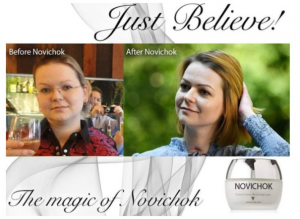 Supposedly Rowley found the “Novichok” perfume in an unopened package that had to have cardboard and cellophane removed with a knife, and the applicator installed. Rowley can not remember where he found the package. Keep in mind, this guy is a known Heroin addict with a dumpster-diving habit. “Presumably the claim is that Russian agents secretly visited the Skripal house, sprayed novichok on the door handle from this perfume bottle, and then, at an unknown location, disassembled the nozzle from the bottle (Mr Rowley said he had to insert it), then repackaged and re-cellophaned the bottle prior to simply leaving it to be discovered somewhere – presumably somewhere indoors as it still looked new – by Mr Rowley four months later. However it had not been found by anyone else in the interim four months of police, military and security service search. My previous article demonstrates that the reactions to poisoning by the drug fentanyl, often used with heroin, mimic the reactions that hospitalized the Skripals, Rowley and Sturgess. This is clearly an effort to set up the Russians in the new cold war. This entry was posted on July 26, 2018 at 2:25 pm and is filed under Tell the truth and run !. You can follow any responses to this entry through the RSS 2.0 feed.